Previous models of creativity are based on linking a subsystem that generates ideas from combining existing concepts with a critic that decides whether these ideas are sufficiently useful and novel. A variety of conditions can lead the critic to be either more severe or more lenient than otherwise. The conditions that make the critic more severe include evaluation apprehension, which frequently occurs in group brainstorming situations, and obsessive compulsive disorder. The conditions that make the critic more lenient include induction of emotions that engender a feeling of certainty or confidence. A network theory for such emotional influences on idea generation is proposed based on extending earlier models to add influences of both the amygdala and orbitofrontal cortex on behavioral gating in the basal ganglia. There have been numerous behavioral studies over the years of the process of brainstorming, that is, generating ideas for solving a specific problem ([1-3]). Both cognitive and motivational factors have been identified that are either favorable or unfavorable for the production of ideas that are both novel and useful. A persistent observation from group brainstorming data is that randomly associated groups typically produce fewer ideas in a given time than the same number of comparable individuals acting alone. One of the cognitive reasons for this productivity gap is that each brainstormer in a group must wait to process the ideas of others before articulating his or her own ideas, and often forgets his or her own ideas before being able to express them. One of the motivational reasons for this productivity gap is what social psychologists call evaluation apprehension, that is, inhibition of expression of ideas due to fear that others in the group will criticize the ideas. This paper focuses on the motivational and emotional influences on creativity. Previous work (; see also  for review) developed and simulated a neural network model of the ideation process that links an idea generation system for combining concepts into ideas for solving a problem with a critic that evaluates those ideas for suitability and novelty. Tentative brain region identifications were made of the concept network with various regions of association cortex and basal ganglia, and of the critic with the basal ganglia behavioral gate. Since emotion-related brain regions such as the orbitofrontal cortex and amygdala are known to have strong connections with the basal ganglia direct and indirect pathways (, ), these connections could be a pathway by which either positive or negative emotion could affect the judgments of the critic, and thereby influence what ideas are either retrieved or expressed. The creative process is embedded in other cognitive capabilities that involve flexible manipulation of concepts. Hence we next review some behavioral data about the effects of various induced emotions on different cognitive tasks that require mental flexibility. Then we review the model of  and suggest extensions of the model to incorporate effects of emotion or affect on idea generation. Early considerations about effects of emotions on judgment concerned the valence, positive or negative, of emotions. Some of the early results indicated that negative emotions tended to engender more careful processing whereas positive emotions engendered more heuristic or automatic processing. This was thought to occur because negative emotions make people feel they need to change their responses to their environments, whereas positive emotions make people feel their current interactions are sufficient for their welfare and so require little thought. For example, Bodenhausen, Kramer, and Süsser  found that participants induced to feel happy from recall of positive life experiences engaged in more stereotypical social judgments than did participants in a neutral mood. Yet other data confound this simple picture about valence and judgment. Ashby, Isen, and Turken  reviewed several results showing that induction of mild positive moods benefits creativity and cognitive flexibility, apparently through the confidence those moods engender. A meta-analysis by Baas, DeDreu, and Nijstad  found that the effects of positive or negative emotions also depended on whether the emotions were high or low in arousal and whether they were associated with approach or avoidance. Lerner and Keltner  went beyond valence and arousal to develop an approach to the effects of specific emotions based on appraisal tendencies. Involving six cognitive dimensions: certainty, pleasantness, attentional activity, control, anticipated effort, and responsibility. In particular, Lerner and Keltner noted that fear and anger are both negatively valenced emotions but differ on the dimensions of certainty and control. In support of appraisaltendency theory as against valence theory, these researchers found that the two emotions tended to lead to different types of risk assessments: people with a dispositional tendency toward anger make optimistic risk assessments whereas dispositionally fearful people make pessimistic assessments. Tiedens and Linton  performed a 2 (positive or negative) valence x 2 (certain or uncertain) certainty level experiment using induction of the four emotions of contentment, anger, worry, and surprise. They found that participants induced to feel emotions of certainty (contentment or anger) but not those induced to feel emotions of uncertainty (surprise or worry) tended toward an expertise heuristic: they were more likely to agree with an argument about education if they believed the argument had been made by a professor than by a student, and were less influenced than other participants by the essay’s content. There was no significant difference between the positive and negative emotions at each certainty level, indicating that certainty was more significant than valence in its effects on the type of processing utilized on judgment tasks. Yet the effects of certainty emotions might depend on how cognitively challenging the task is. Inbar and Gilovich  gave participants some numerical general knowledge questions (e.g., the boiling point of water on the top of Mt. Everest) for which they were expected to “anchor” from values they were likely to know already (e.g., the boiling point of water which is 212 degrees Fahrenheit). The amount they adjusted from these anchor values was considered an indication of how deeply they engaged their cognitive processes. The participants adjusted more from self-generated anchors if they had seen film clips promoting anger or disgust (certain) than sadness or fear (uncertain). Typically the anchor numbers the participants generated were based on exact knowledge of the answer to something related: for example, the anchor for the boiling point of water on Everest was 212 degrees, the boiling point of water at sea level. Inbar and Gilovich’s explanation was that “the appraisals of certainty associated with some emotions can lead individuals to feel confident and in control, and thus to engage in more energetic cognitive processing” (p. 567). That could be analogous to the disinhibiting effect of induced happiness on creativity . The same effect does not occur if the anchor is experimenter-generated. In judgment tasks more generally, if the task instructions cue cognitive passivity, certainty emotions (positively or negatively valenced) can lead participants to feel confident in answers they have already arrived at, engendering heuristic processing. But if the task instructions cue a high level of cognitive activity, the same certainty emotions can lead participants to feel confident in their own mental acuity, engendering careful processing. Another example of certainty emotions leading to more careful processing was in a study of the ratio bias task . In the ratio bias task, participants are asked to decide which of two small probabilities is larger; with incongruent pairs, whereby the larger numerator and denominator correspond to the smaller probability (e.g., 9/100 versus 1/10), many choose the larger numbers even with worse odds (e.g., ). Liu  induced in different groups of participants, through cuing recall of emotion-appropriate life experiences, the four emotions of happiness (positive and certain), hope (positive and uncertain), disgust (negative and certain), and fear (negative and uncertain) and then gave her participants ratio bias problems. She found no effect of valence but a significant effect of certainty, whereby the certainty-inducing emotions led to both greater confidence and greater accuracy on this numerical judgment task. While the data discussed in this section deal with a diverse array of cognitive tasks other than creative brainstorming, they suggest how similar emotions, whether experimenter-induced or naturally occurring, might affect the brainstorming process. In particular they suggest that on cognitively challenging tasks, emotional states that engender a feeling of certainty confidence would tend to lead to the sort of cognitive flexibility that overcomes both evaluation apprehension and functional fixedness (cf. ). Conversely, emotional states that engender feelings of uncertainty would tend to increase evaluation apprehension and functional fixedness. We now turn to a network modeling the creative process to see how such a network might be influenced by either type of emotion. We briefly summarize the network model of creative ideation described in more detail elsewhere (, ). The system, shown in Fig. 1, can be divided broadly into two complementary components: an idea generating system (IGS) that encodes semantic information and generates ideas in response to task requirement, and a critic that evaluates these ideas for appropriateness. 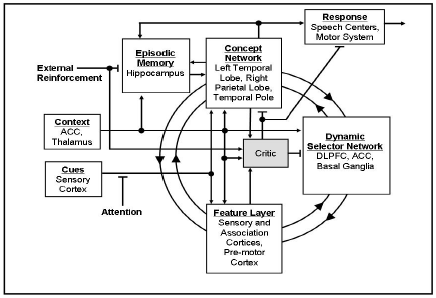 Thus, the IGS embodies the functions of semantic representation, episodic memory, working memory and cognitive response, while the critic encompasses reinforcement and modulation. 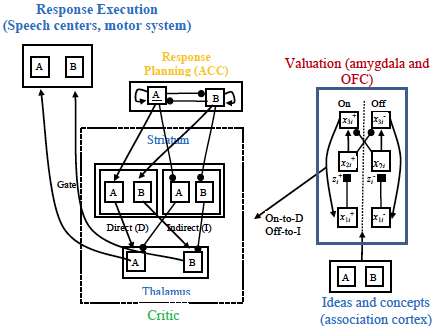 For simulation, the system is configured using a training set of relevant ideas in several contexts, representing the experience of the system. Since the system learns based on the ideas in this training set, its responses exploit the regularities implicit in the set and provide the initial basis for idea generation in both familiar and novel contexts. If this turns out to be inadequate in a particular context, the reinforcement learning process mediated by the critic gradually modifies the system’s weights to improve performance in this context. In previous work (, ), the critic was associated with the gates in the basal ganglia, whereby the striatal direct pathway becomes active in response to a stimulus or internal state that leads to performance of a behavior (in this case, articulating an idea) and the striatal indirect pathway becomes active in response to a stimulus or state that leads to withholding of a behavior. The precise responses of the critic and external influences on the critic were left imprecise. So how might we understand the influence of different emotions on the critic? One clue to the influences on the critic may come from clinical studies of patients with conditions that exaggerate the uncertainty responses. One such condition is obsessive-compulsive disorder (OCD). Stern et al. verified that OCD patients rate themselves as more uncertain than normal when performing gambling tasks with very low objective uncertainty. An fMRI study showed that these same OCD patients had greater activation in a network of brain areas associated with valuation including the amygdala, orbitofrontal cortex (OFC), insula, and several other areas. Moreover, in OCD patients the functional connectivity between those valuation regions was higher than in normals. 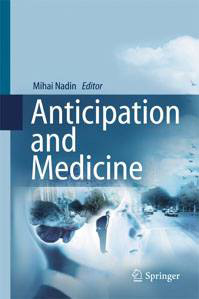 Clinical syndromes typically can be interpreted as exaggerated manifestations of conditions found in normal humans; indeed, they are maladaptive exaggerations of cognitive-emotional mechanisms that have evolutionary value in moderation. Mild evaluation apprehension has evolutionary value because it preserves an individual’s bonds with the group and protects them from the consequences of acting impulsively. While the brainstorming tasks are different from the gamble discussed in , it is a useful first approximation to see OCD as an exaggeration of the mechanisms leading to normal apprehension at dealing with uncertain information, including evaluation apprehension in social settings. Hence we model the emotional influences on idea generation via amygdalar and OFC influences on the basal ganglia (striatal) gate, as shown in Fig. 2. In models by Levine et al. of decision making tasks (, ), the amygdala and OFC send affective signals to the striatal-thalamic-cortical pathway that excites or inhibits behavioral responses. The network of Fig. 2 combines parts of the decision network of  and the ideation network of Figure 1 whereby the critic is identified with the striatal-thalamiccortical pathway. In the network of Fig. 2 the amygdalar and OFC influence is shown in the form of a gated dipole , a network that combines “on” and “off” channels of opposite significance in such a manner that shutting off either channel transiently activates the opposite channel. In this case the on channel transmits signals that promote certainty or confidence in one’s cognitive processes and therefore favor articulation of an idea. The off channel transmits signals of uncertainty that oppose articulation. The on signals in turn excite the striatal direct pathway which yields “GO” signals, whereas the off signals excite the striatal indirect pathway that yields “STOP” signals. Emotional states that promote uncertainty therefore bias the amygdalo-striatal signals toward activation of the indirect pathway and therefore reduce articulation of ideas. These emotional states can include incidental moods, whether natural or experimenter-induced, of uncertainty-related emotions such as fear or hope. They can also include apprehension from being in the presence of other people who might be critical, and there is evidence that brainstormers on the average feel this less when interacting via computer instead of face-to-face . Finally, these states can include the prevailing states of patients with conditions such as OCD. Conversely, emotional states that promote certainty bias the amygdalo-striatal signals toward activation of the direct pathway and therefore tend to increase articulation of ideas. These states can include incidental moods of certainty-related emotions such as happiness, anger, and disgust. Brainstorming success is also increased by giving different brainstormers in the group defined sub-tasks that are different between group members, and the cognitive priming from a known expectation strengths the feeling of certainty. The network shown in Fig. 2 for emotional influences on creativity is a schematic one that leaves out considerable detail. For example, in the decision network of  the amygdala and OFC constituted separate layers not shown here with the OFC at a category level and amygdala at an attribute level, joined in an adaptive resonance module for affectively based categorization. Also the symmetry between affective signals of different signs is an oversimplification. Considerable evidence exists that positive and negative affect (whether in the sense of certainty, as used in this paper, or the more traditional sense of pleasure and displeasure) are subserved by separate neural systems. Dopamine neuromodulation plays a major role in the positive but not the negative affective system (see  for a review), and there is more sketchy evidence that serotonin plays a role in the negative affective system as a sort of stabilize that puts the brakes on activity engendered by dopamine (see  for a decision model that uses a form of opponency between dopamine and serotonin). The perception of certainty or uncertainty can be considered as one aspect of metacognition. Metacognition is defined as knowledge and monitoring of one’s own cognitive processes. It includes, among other things, judging one’s likelihood of knowing the answer to a question to be asked; stating the degree of confidence one has in the answer to a question; and remembering where one learned a particular piece of knowledge (the latter is called metamemory). The psychologists Nelson and Narens  discussed the hierarchical nature of general cognition versus metacognition: metacognition operates at a higher level, that is, represents other cognition and controls it. Metacognition can be further subdivided into metacognitive knowledge, experience, and skills . Metacognitive processes are an important component in all cognitive monitoring whether creative or conventional. They have not been studied much in neural networks so far, Suresh and his colleagues have been studying the inclusion in artificial neural networks of the metacognitive capacities of deciding what, when, and how to learn (see, e.g., ). Incorporating metacognition in brain-based networks is bound to be a long process due to its multifarious nature, but networks such as the one of Fig. 2 begin to point the way. Fig. 2. Network combining emotional influences from the amygdala and OFC with the critic at the striato-thalamo-cortical loops. A and B denote two possibly competing ideas. Arrows denote excitatory signals, filled circles inhibitory signals. In the gated dipole, the node activities are denoted by x’s with + for “on” activities, - for “off” activities (see text), and depletable transmitter weights by z’s. A. F. Osborn, Applied Imagination (1st Ed. ), Scribner, New York, 1957. P. B. Paulus and V. R. Brown, “Enhancing ideational creativity in groups: Lessons from research on brainstorming,” in P. B. Paulus and B. A. Nijstad, B. A. (Eds. ), Group Creativity: Innovation Through Collaboration, pp. 110-136, Oxford University Press, New York, 2003. P. B. Paulus and V. R. Brown, “Toward more creative and innovative group idea generation: A cognitive-social motivational perspective of brainstorming,” Social and Personality Compass, 1, 10:1111/j.1751-9004.2007.00006.x, 2007. L. R. Iyer, S. Doboli, A. A. Minai, V. R. Brown, D. S. Levine, and P. B. Paulus, “Neural dynamics of idea generation and the effects of priming,” Neural Networks, Vol. 22, 674-686, 2009. P. B. Paulus, D. S. Levine, V. R. Brown, A. A. Minai, and S. Doboli, “Modeling ideational creativity in groups: Connecting cognitive, neural, and computational approaches,” Small Group Research, Vol. 41, 688-724, 2010. J. Newman and A. A. Grace, “Binding across time: The selective gating of frontal and hippocampal systems modulating working memory and attentional states,” Consciousness and Cognition, Vol. 8, 196-212, 1999. D. S. Levine, “Angels, devils, and censors in the brain,” ComPlexus, Vol. 2, 35-59, 2005. G. V. Bodenhausen, G. P. Kramer, and K. Süsser, “Happiness and stereotypic thinking in social judgment,” Journal of Personality and Social Psychology, Vol. 66, 621-632, 1994. F. G. Ashby, A. U. Turken, and A. M. Isen, A. M, “A neuropsychological theory of positive affect and its influences on cognition,” Psychological Review, Vol. 106, 526-550, 1999. M. Baas, C. K. W. De Dreu, and B. A. Nijstad, “A metaanalysis of 25 years of research on mood and creativity: Hedonic tone, activation, or regulatory focus?,” Psychological Bulletin, Vol. 134, 739-756, 2008. J. S. Lerner and D. Keltner, “Beyond valence: Toward a model of emotion-specific influences on judgment and choice,” Cognition and Emotion, Vol. 14, 473-493, 2000. Y. Inbar and T. Gilovich, “Angry (or disgusted) but adjusting? The effect of specific emotions on adjustment from self-generated anchors,” Social Psychological and Personality Science, Vol. 2, 563-569, 2011. V. Denes-Raj and S. Epstein, “Conflict between intuitive and rational processing: When people behave against their better judgment,” Journal of Personality and Social Psychology, Vol. 66, 819-829, 1994. A. Farajidavar, D. S. Levine, N. W. Kohn, and P. B. Paulus, “Modeling the beneficial effects of incubation in creative brainstorming,” WCCI 2010 IEEE World Congress on Computational Intelligence, 2722-2727, 2010. S. Doboli, V. R. Brown, and A. A. Minai, “A conceptual neural model of idea generation,” Proceedings of the International Joint Conference on Neural Networks (Atlanta, GA), 2009. E. R. Stern, R. C. Welsh, R. Gonzalez, K. D. Fitzgerald, J. L, Abelson, and S. F. Taylor, “Subjective uncertainty and limbic hyperactivation in obsessive-compulsive disorder,” Haman Brain Mapping, in press, doi 20.2003/hbm.22038. D. S. Levine, B. A. Mills, and S. Estrada, “Modeling emotional influences on human decision making under risk,” Proceedings of International Joint Conference on Neural Networks, August, 2005, 1657-1662. D. S. Levine,“ Neural dynamics of affect, gist, probability, and choice,” Cognitive Systems Research, Vol. 15-16, 57-72, 2012, doi:10.1016/j.cogsys.2011.07.002. S. Grossberg and N. A. Schmajuk,“ Neural dynamics of attentionally- modulated Pavlovian conditioning: Conditioned reinforcement, inhibition, and opponent processing,” Psychobiology, Vol. 15, 195-240, 1987. A. Litt, C. Eliasmith, and P. Thagard, “Neural affective decision theory: Choices, brains, and emotions,” Cognitive Systems Research, Vol. 9, 252-273, 2008. T. O. Nelson and L. Narens, L., “Why investigate metacognition?” in J. Metcalfe and A. Shimamura (Eds. ), Metacognition: Knowing about Knowing, pp. 1-25, MIT Press, Cambridge, MA, 1994. A. Efklides, “Metacognition: Defining its facets and levels of functioning in relation to self-regulation and co-regulation,” European Psychologist, Vol. 13,277-287, 2008. Babu, G. S., & Suresh, S. (2012). Meta-cognitive Neural Network for classification problems in a sequential learning framework. Neurocomputing, 81, 86-96.